These books revolutionized my whole life. My kids will read every single one. Beautiful! From a time when morals and ethics were the true fundamentals to reaching success.. not quick fix nonsense! I often refer people to this app because it has so much fabulous content. I've had it over two years and am still working my way through it. Highly recommended. Been using this app for a couple of months now and have nothing but great things to say! It is so nice to have all these public domain books in one convenient location! I'm still trying to figure out how to highlight (you may not be able to) but at the end of the day who cares?! These books are truly awesome! 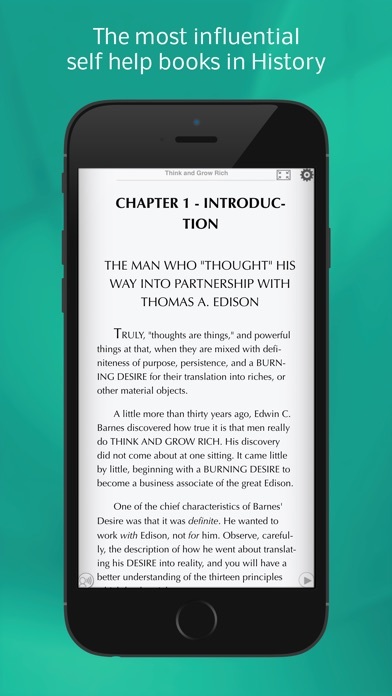 This is simply amazing, it literally consists of dozens and dozens of classic self-help books and if you're like me and you love a good read that can truly better yourself, you'll enjoy this app! You will use it every single day so don't waste your time, Go download this app now!!!!!! I've had this app for several years now and don't know why I've waited until now to write a review. 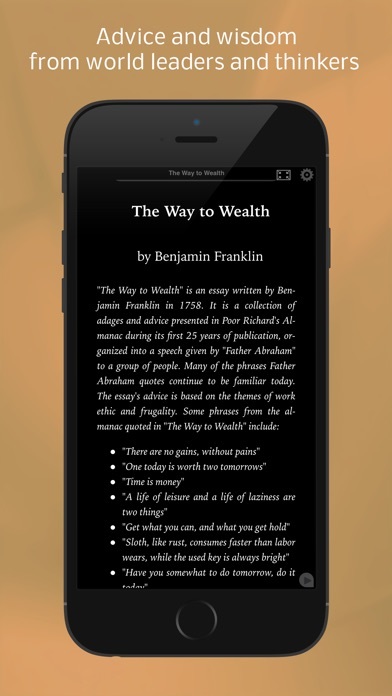 I am always reading or re-reading the many books included in this app. This is a collection of some of the greatest works from pioneers in "The Law of Attraction" mindset way before it was labeled that way and is a must have for anyone who wants to make a positive change in their life. Very well though out. Nicely put together. Holy cow! 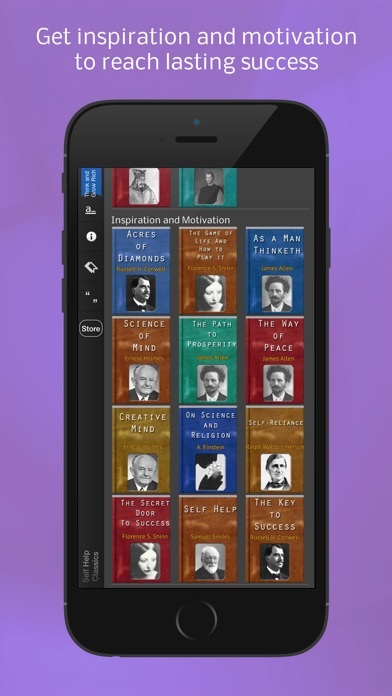 This app has tons of insightful books. Very generous of the app dudes. Appreciate it bros. This app is great! It offers some of the best self help books, the knowledge here is priceless. The best app on my phone! I can't express how important this app has been for me. It has changed my life, my relationships and my career. I'm now out of debt, happily engaged with the most wonderful girl in the world, have a great job that I truly love going to, and am balanced and in tune with the universe. I know my purpose and the way to get to my goals. All of this thanks to a 0.99 app that I've downloaded a bit over 1 year ago. Trust me, this is lifechanging! The first several paragraphs talk about the 60 books included. This is not true. You only have access to 34, but can purchase more up to 60 books. I would give negative stars for this company. New icon is nicer looking, the new preferences panel is cleaner and the new free voice option is incredible! Many great reads. Wisdom at your fingertips. Incredible value for such a low price. Good books, lean usage, great weekend or comute companion! Great source of business & personal knowledge of improving your life! I have been using this app for YEARS and it's the best. I absolutely luv this app! If you need a great app this is bargain. I find and share inspiring messages everyday! 🔥Get this app for yourself and read or listen for your own health. I have been truly blessed by coming across this app. It's has added so much already in my life. An incredible read absolutely fantastic. Books that are so important to the human race. Make sure our hearts and minds are taught this! Looking for Happiness? Get this app now! A great collection of books that everyone needs to read. I love this app!!! Some of the greatest self improvement books are here. I use this almost every day. I love this app. There are tons of great books and so much value. 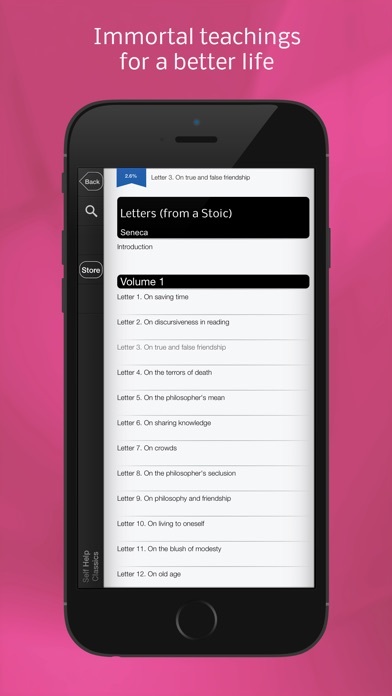 This is a very well done app with great reading. I especially recommend "The Master Key System" and the selections by Florence Scovill Shinn. These are gold mines! The app interface is very clean and functional which makes reading a pleasure. Highly recommended! Update: still love it but suddenly the bookmark function doesn't seem to work. Have deleted it from iPad and re downloaded but it still doesn't work. I love this app an giv it a five star rating they hav added 3-4 books since I bought it and hav a large selection of books I hadn't heard of an love thanks guys an keep up the good work. This app is full of great stuff. Life changing. I'm blessed thanks. 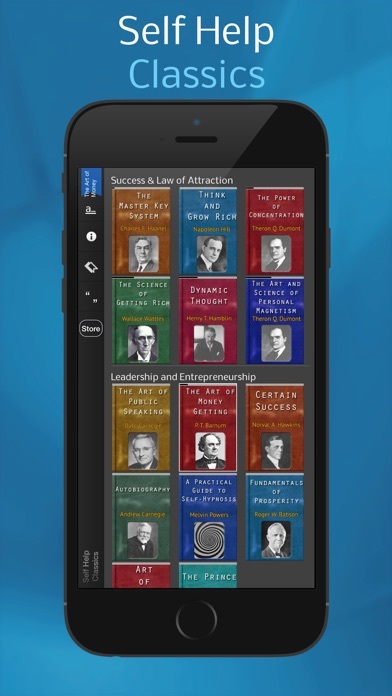 Many of my favorite and "go to" books in one very convenient app. Hours of inspirational reading or listening.